The following procedure will export some of your basic FlockFiler Pro sheep information from all sheep records and import it into FlockFiler Lite. Push the "Export all data to many text files" located on the Advanced sheep form under the "Import/Export" tab. This will automatically create one export file in the "Exports" folder for each table of information in FlockFiler Pro. Launch "Import Assistant..." from the File menu (of either FlockFiler Lite or FlockFiler Pro). Push the "Read in your information from a Spreadsheet" button. Choose "Names" in the dialog that pops up. Choose "FFP_Sheep.csv" located in the "Exports" folder of your FlockFiler installation folder. You may have to tell your file open dialog to show you all files instead of limiting them to a specific type for you to choose that file. (optional)Locate and delete any records that you do not want to import into FlockFiler Lite. You can perform Finds using this screen. If you want to locate the records you were browsing in FlockFiler Pro when you exported the records in the first step, search for a 1 in the BrowsedWhenExported field. Push the "Step 4" button. Make sure that the menu selection for "The date format used in your data" is matches your usual format. 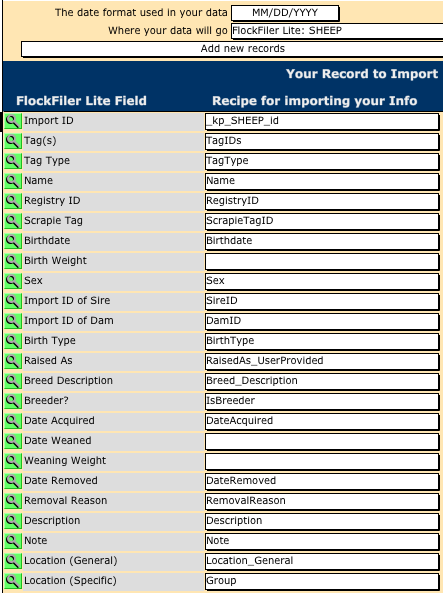 Choose "FlockFiler Lite: SHEEP" for "Where your data will go". Choose "Add new records" for the action. Set up your recipe for importing using the selections in the following image or can download this recipe file using your web browser, unzip it, and load it into the Import Assistant using the "Load Recipe" button. Push the "Step 5" button. Push the "Import into FlockFiler" button. Your FlockFiler Pro records are now imported into FlockFiler Lite.